Averaging the data from 8 precipitation gauges scattered across the City, the Winter Haven area grossed 10.61 inches of rainfall during the month of July. Since Winter Haven is a rainfall driven system, it is important to quantify the net rainfall gain (or loss) as this impacts aspects such as lake levels and aquifer recharge. Water loss through evaporation and plant uptake (evapotranspiration) is subtracted from the gross to calculate net rainfall for the area. Total evapotranspiration for July was 5.16 inches, which translates to 5.45 inches of net rainfall for the month. Tallying the monthly net rainfall totals in 2018, this marks the first time that Winter Haven has observed a net surplus in rainfall this year. See Figure 1 for a graph of these values. Compared with historic records dating back to 1915, this month’s gross rainfall has been considerably high—See Figure 2. 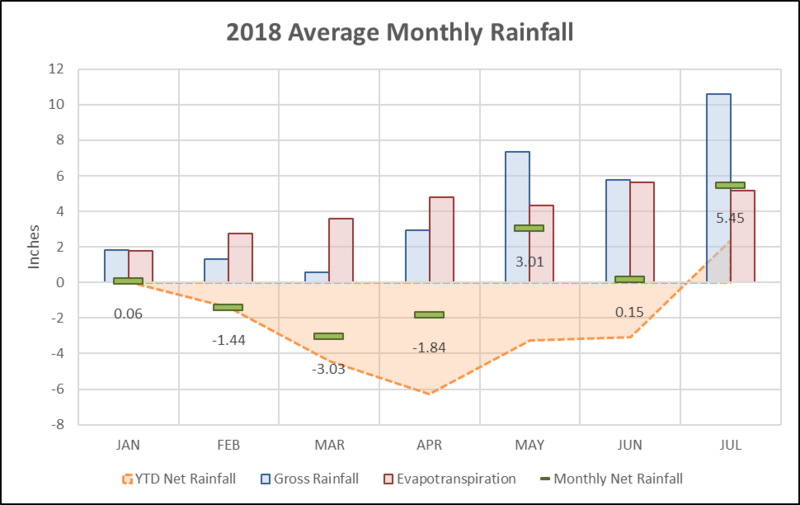 The monthly precipitation total fell well above the long-term July average of 7.95 inches; even surpassing the upper limit of the normal range at 10.06 inches. In fact, this month’s total fell just outside the 90th percentile of monthly rainfall averages for the period of record. In conclusion, the above average rainfall during July has allowed for a year-to-date surplus in water entering the Winter Haven system—leading to groundwater and surface water recharge. 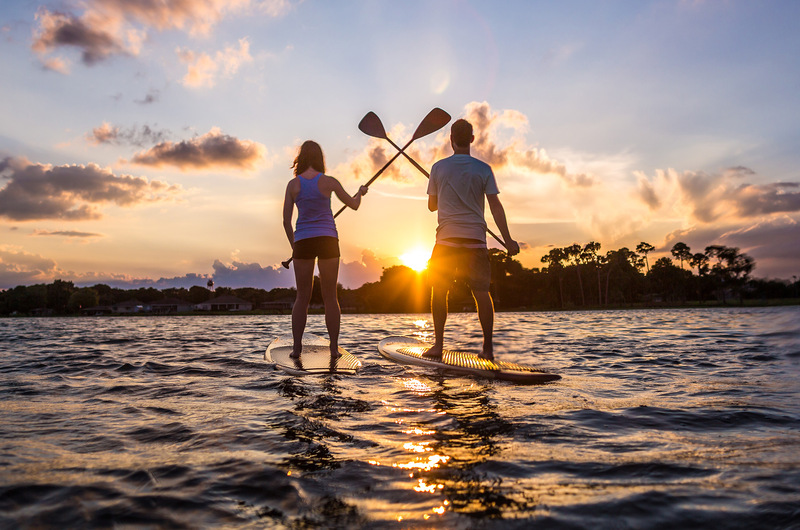 The average stage of the Southern Chain of Lakes saw a considerable increase from 131.23 feet above sea level in June to 131.65 feet in July. While this might not appear to be such a drastic change over the course of a month, keep in mind that the average does not represent the highest lake level observed during that period. In actuality, the surface level rose to 132.4 feet in the final days of July. The maximum management level for the Southern Chain of Lakes, or the level at which it freely to discharges to the Peace Creek, is 132 feet; which means that these lakes are currently contributing surface flow to the Peace River. Compared to historic data, the July average lake stage fell well above the long-term mean of 130.56 feet and is at the top of the normal range (See Figure 3). While the 2018 average doesn’t quite reach the maximum recorded July average of 132.15 feet in 2005, it is within the 80th percentile. 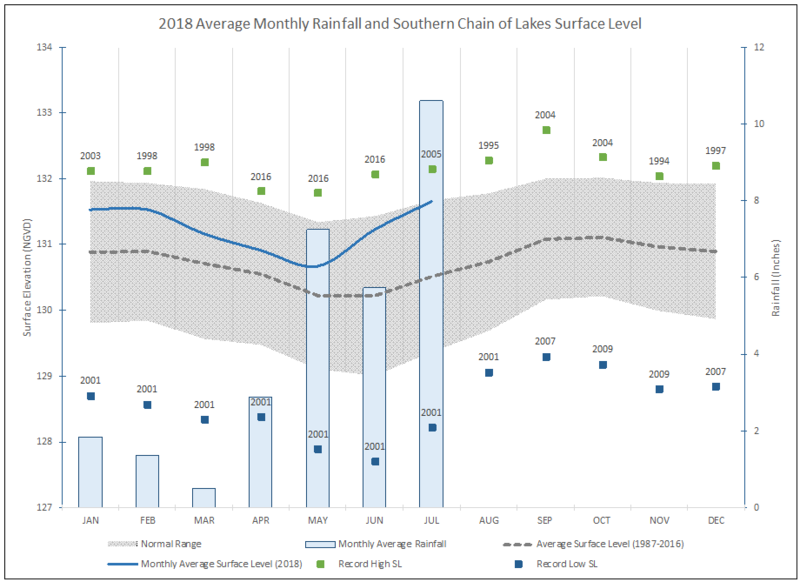 In conclusion, the considerable rainfall during July of this year has caused a significant increase in lake stage—placing the current surface levels at their maximum management level. The City plans to watch these levels closely as we continue through toward the end of the rainy season.